I managed to drag myself out of bed for the line throwing and exit of the harbour. It was uncomfortable as the sea was still up though there wasn’t much breeze. We exited at around 8am, and turned south under engine at around 7 knots. We put up the main to steady our motion, and pulled out the heady, and were able to sail for a while, at which point I retired back to bed. I heard the whale song, quite soon after that, very clear and seemingly quite close. It must have been as there was some deck action, but given the number of whales we have seen, I preferred to keep sleeping! I was freezing at first so wrapped myself in Petes sea rug, and finally got warm enough to drop off. 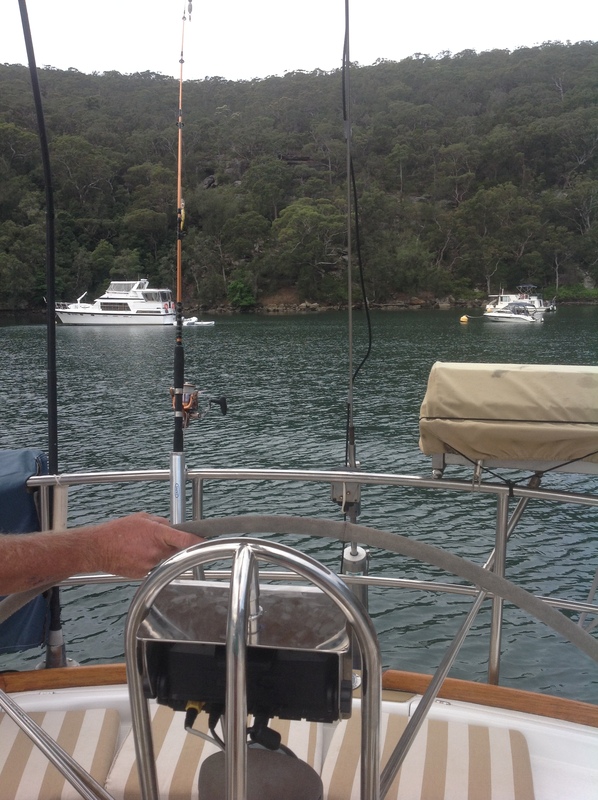 When I came to, it was midday and we had the sails on the other tack and the engine on. 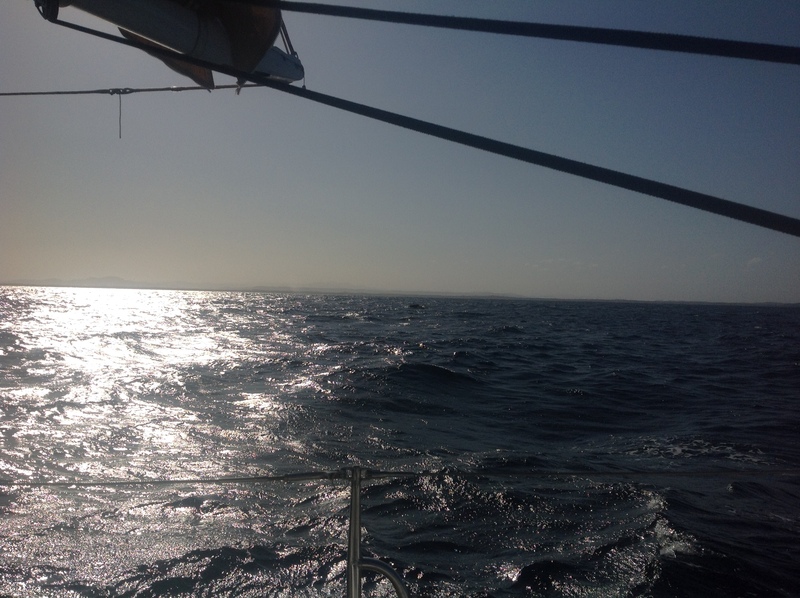 We headed on down the coast, with wind gradually increasing and by around 4 we were able to put out the assy again. This was short lived though, and the forecast was for increasing breeze from the north, so we took down the assy, put a reef in the main and poles out the genny. These manoeuvres all Sound smooth, but they were not all that smooth and did take a little time! However, post all this,we were able to sit down with our sundowners, though later now, at 5:30. More whale sightings over drinks, then dinner was served. If you look very carefully you can see a whale back in the centre of this picture! As we ate dinner, there were several pot sightings close to our track, so as I rugged up for watch, Paul kept a look out to see if we could spot if they were on the 50 m contour. It seems they were as we passed the last one we could see at around 7:30 pm and Paul headed below, leaving me on watch for the first stint until 9. It was an ok night and though there was a fisho on my starboard shoulder who moved about a lot, we eventually left him behind. I saw red lights on my port bow but after watching carefully for a while, I realised it was distant meteors. One ship only, nothing much else to report to Clare when she came up at 9. I retired to bed. Heard Clare talking and realised she and Paul were trying to do something on deck, so I grabbed my life jacket and got up to assist. We dropped the main, and put out bob and the heady, which seemed to steady the motion a bit, and it retired back to bed. I popped the mattress on the floor in Petes old bedroom and being low down and jammed between the side of the bunk and the wall, it was comfortable and secure. 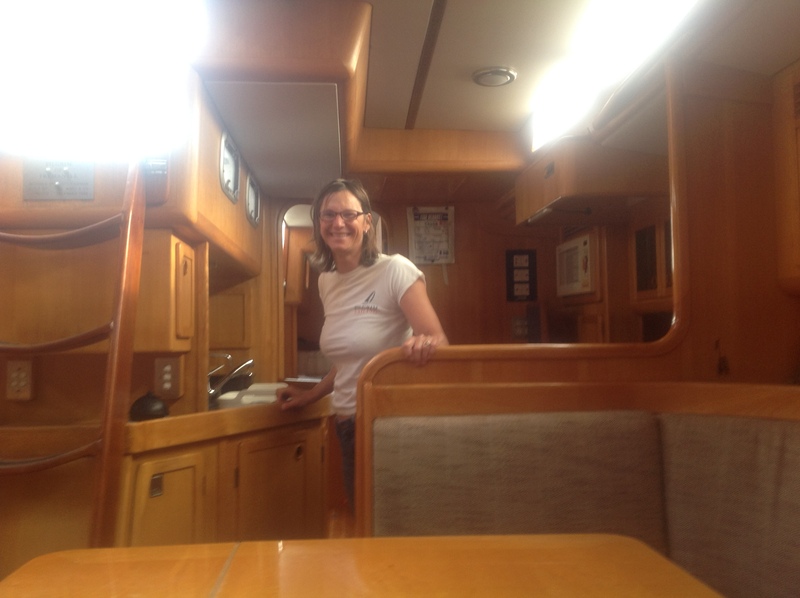 It didn’t help me sleep very much though as we alternated between sailing and engine through the night. I don’t think anyone got much sleep, with the rocking and rolling. When we were sailing the whole interior of Pilgrim rolled about, with crockery and cutlery, cans and bottles, and anything not securely tied down rocking and crashing together. It was a total cacophony. On the other hand with the engine running, it dominated the noise and created a series of rattles. This was largely because the wind was directly behind us and the sea state was a combination swell from the south east and the North East, both fighting for supremacy! When I got up for my 3am watch, Pete handed over in 16-20 knots travelling quite comfortably. 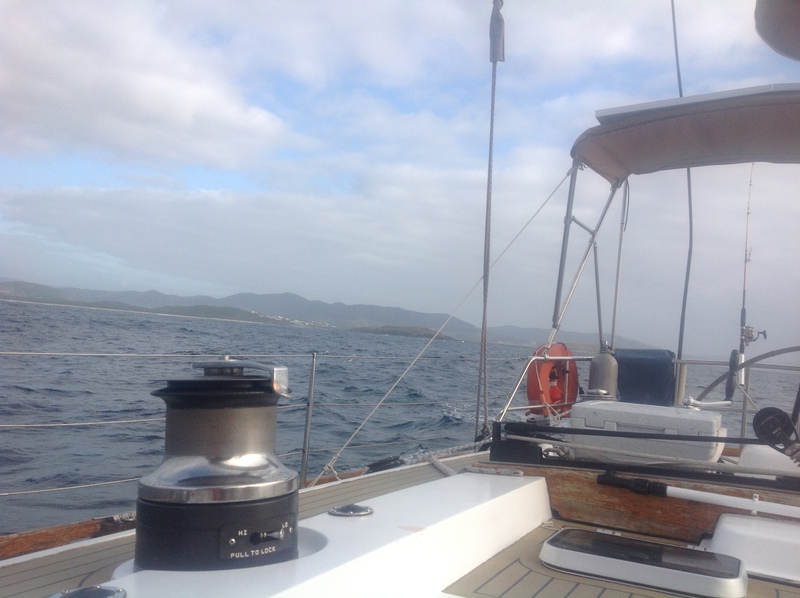 Of course, as usually happens, when I get the helm the wind drops, and it did and I had to engine up to stop the roll. When Clare came up at 5am, the moon had just risen, a sad but beautiful waning crescent, low on the horizon, being out- dazzled by Venus. Fell into my bed and thankfully slept for 3 hours. When I finally got up, everyone was roused and I offered to make a chorizo tomato and egg bake for brunch, which everyone agreed to, so I roused it out and it turned out great. Served with a little warm and crusty sourdough, a delight to our tied and hungry systems. 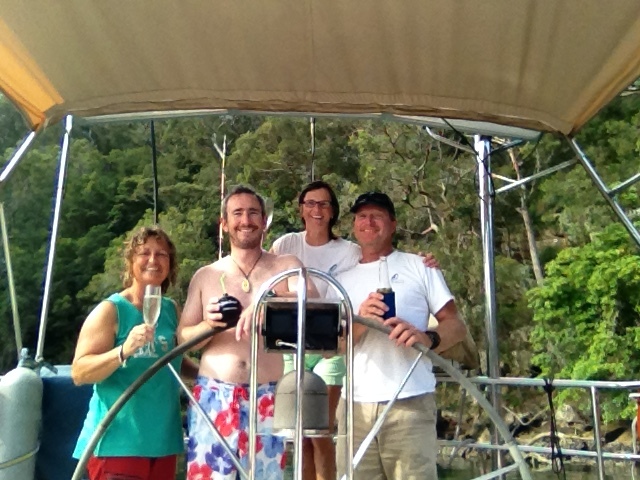 The trip continued down the coast, not as quickly as we had hoped, but we we made the heads at Pittwater at 2:45 pm, as the Lion Island race boats were rounding their mark. We headed up to Castle Lagoon, for our final anchorage of the trip – at least for Pete and I who would be heading home in the morning. It was a big surprise to see Castle Lagoon, free of any anchored boats, just the 4 public moorings taken. So we assumed our usual spot deep at the rear of the lagoon. 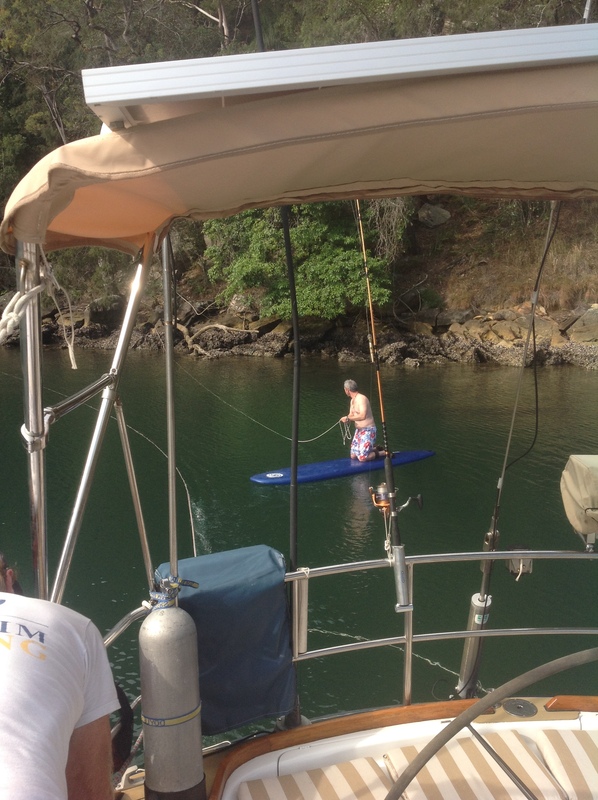 Pete paddled in on the paddle board to tie our stern off to a rock. Paul wasn’t too comfortable the first time, so Pete went in again with another line, so we could haul around to starboard a little more, and then it was time for beers to celebrate Clare and Paul’s full circle. They had left from this very anchorage at Easter to head north. It was as ever a beautiful night at Castle Lagoon, very still though a slight chill in the air. We had roast lamb for dinner, as is now our Pittwater tradition, and then another early night, to make up for the lack of sleep the previous night. It was still as can be, not a movement on the water and not a clang, crash or creak to be heard. We all slept very soundly.